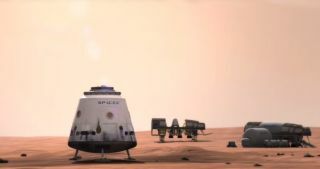 SpaceX's manned Dragon spacecraft could make a human colony on Mars possible as shown in this still image from a SpaceX video. The private spaceflight company has targeted manned Mars exploration as a long-range goal. WASHINGTON — SpaceX thinks humanity needs to reach Mars to survive. Manned exploration and the eventual colonization of Mars would not only be a marvel of human achievement, it would also serve as a sort of insurance in case disaster strikes on Earth, SpaceX president Gwynne Shotwell told a small crowd here Wednesday (June 4). "Exploration is really what separates humans from other living species," Shotwell said during an Atlantic Council Captains of Industry discussion. "If we decide that where we are today is 'it,' that seems like a big disappointment." If humans decided to stop exploring, saying, "This is it, we're done," that's not very inspirational, Shotwell said. But exploration isn't the only reason to visit the Earth's rouge neighbor. Creating a settlement on Mars also constitutes "risk management" for the human race, Shotwell said. "The probability of a significant [disastrous] event happening on Earth is very high," Shotwell said. Though she said she doesn't know when it might happen, "it would be nice to have humans living in more than one spot." By all appearances, SpaceX has been a force in the business of launching rockets into orbit. The company has made nine out of nine successful launches of its Falcon 9 rocket, which has carried its Dragon capsule to the International Space Station on multiple occasions. The company has recently tested its reusable rockets. SpaceX completed a successful rocket test on April 18 in which it launched a two-stage Falcon 9 rocket from Florida, and landed the first stage vertically on a target in the Atlantic Ocean. On May 29, the company unveiled its manned Dragon V2 spaceship, which would serve as a kind of space taxi to ferry astronauts to and from the International Space Station. The company is also developing a massive launch vehicle, the Falcon Heavy, which would be the most powerful U.S. rocket to launch since the Saturn V. "Hopefully we will launch [the Falcon Heavy] in the first half of next year," Shotwell told Space.com. SpaceX has not yet developed the capability of exploring beyond the Earth's orbit. But Elon Musk, the company's billionaire CEO, has expressed ambitions for reaching the Red Planet, and claims the company has made progress toward establishing a colony there. During the International Space Development Conference last month, Musk said that "the reason SpaceX was created was to accelerate development of rocket technology, all for the goal of establishing a self-sustaining, permanent base on Mars."